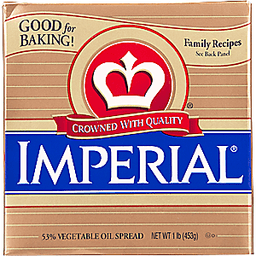 Blue Bonnet® Light 39% Vegetable Oil Spread. 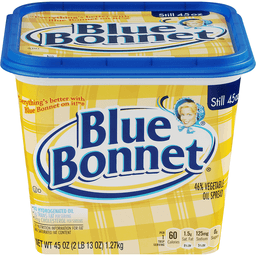 "Everything's better with Blue Bonnet On It®!" 0g trans fat per serving. 0mg cholesterol per serving. No hydrogenated oil. 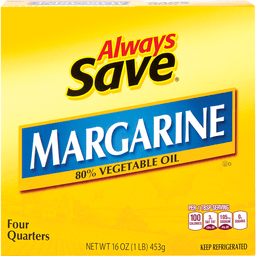 50% less fat & 40% less calories than regular margarine. See nutrition information for fat and saturated fat content. 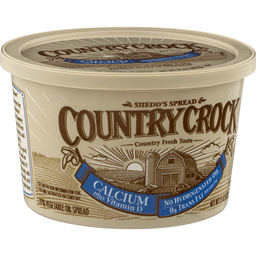 Per 1 tbsp serving: 60 calories. 2g sat. fat, 10% DV. 80mg sodium, 3% DV. 0g sugars. Net wt 16 oz (1 lb) 454g. ConAgra Foods®, food you love. Paper, box. how2recycle.info. 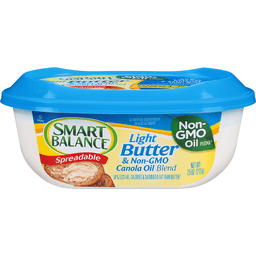 Blue Bonnet® light spread adds a smooth, delicious taste for your family's meals with 50% less fat and 40% less calories than regular margarine. Try our light spread on bagels, vegetables or any of your favorite foods. 0mg cholesterol per serving: Per serving (1 tbsp) - cal. - fat - chol. 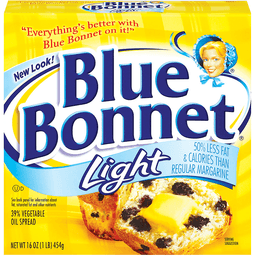 Blue Bonnet® light (14g) - 60 - 5g - 0mg. 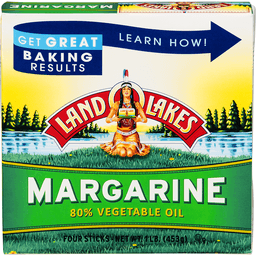 Margarine (14g) - 100 - 11g - 0mg. Butter (14g) - 100 - 11g - 30mg. Satisfaction guaranteed. Questions or comments 1-800-988-7808. For delicious recipes, visit bluebonnet.com. No hydrogenated oil. 0 g trans fat per serving. 0 mg cholesterol per serving. 60 calories per serving. 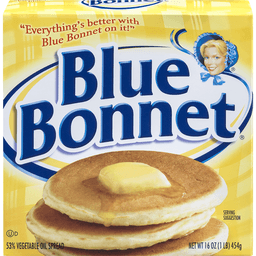 Everything's better with Blue Bonnet on it! Still 15 oz. 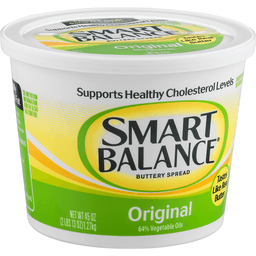 Per Serving (1 tbsp): Blue Bonnet (14 g): 60 calories, 6 g fat, 0 mg cholesterol; Margarine (14 g): 100 calories, 11 g fat, 0 mg cholesterol; Butter (14 g): 100 calories, 11 g fat, 30 mg cholesterol. 0 mg cholesterol. 100% less cholesterol than butter. Gluten free food. Food you love. Satisfaction guaranteed. For delicious recipes, visit bluebonnet.com. 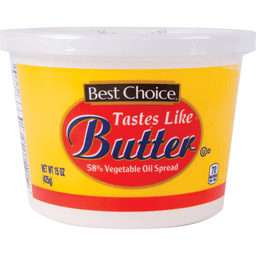 Move Over Butter® Whipped Vegetable Oil Spread. Space saver tub. No hydrogenated oil. 0g trans fat per serving. Whipped with sweet cream buttermilk. 50 calories per serving. Net wt 10.05 oz (285g). 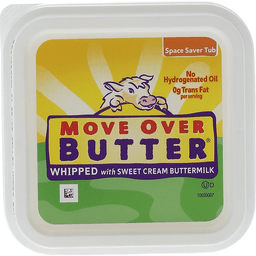 Grams of fat per serving: Move Over Butter® whipped - 6. Butter - 11. ConAgra Foods® food you love. Gluten free food. Questions or comments 1-800-988-7808. Fresh & creamy tasty. Per Serving: 0 g trans fat; 0 mg cholesterol. See back panel for information on fat, saturated fat and other nutrients. 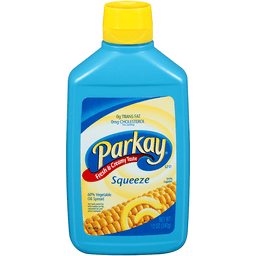 Parkay Squeeze contains 0 grams trans fat per serving. Per Serving (1 tbsp): Parkay Squeeze (14 g): 8 g fat; 70 cal; 0 mg chol. 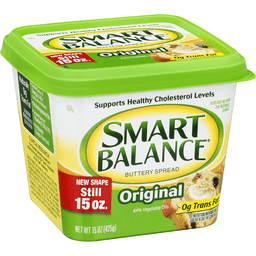 Butter (14 g): 11 g fat; 100 cal; 30 mg chol. Food you love. 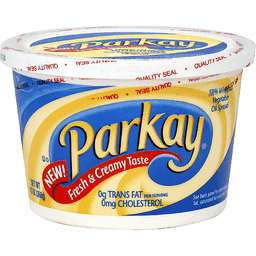 Enjoy the rich, creamy, buttery taste of Parkay on all your family's foods, and it's cholesterol free! Try other great Parkay products. For delicious recipes, visit www.parkay.com. Questions or comments? Call 1-800-988-7808. 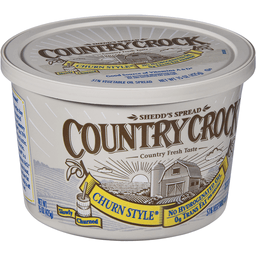 Country Crock® Churn Style® Shedd's Spread. New! Space saver tub. Simple recipe. Country fresh taste. Real taste from real ingredients. 50 Calories per 1 Tbsp. 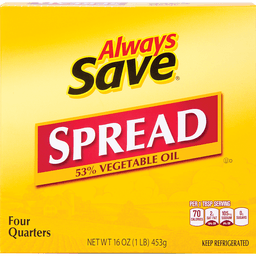 40% Vegetable oil spread. Gluten free. No artificial preservatives. 0g trans fat per serving. No partially hydrogenated oils. No cholesterol per serving. 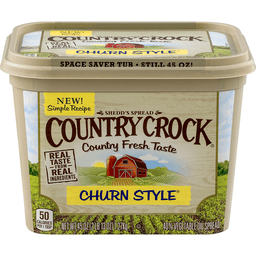 Per serving: Country Crock Churn Style® - Fat - 6g. Sat. fat - 1.5g. Cal. - 50. Chol. - 0mg. Butter - Fat - 11g. Sat. fat - 7g. Cal. - 100. Chol. - 30mg. Questions or comments Call 1-800-579-3663 or visit us at countrycrock.com. ©Unilever. Blue Bonnet® 8 Stick Family Pacy 53% Vegetable Oil Spread. Everything's better with Blue Bonnet on it! 0g Trans fat per serving*. 0mg Cholesterol per serving. No hydrogenated oil. Per 1 tbsp serving: 60 Calories. 2.5g Sat. fat, 13% DV. 130mg Sodium, 5% DV. 0g Sugars. Contains 8 - 4 oz sticks. Net Wt 32 oz (2 lb) 907g. Enjoy the smooth, buttery taste of Blue Bonnet®. 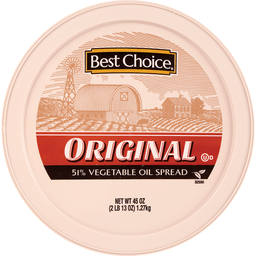 For over 60 years, consumers have trusted Blue Bonnet to deliver quality spreads at the right price. And you can trust Blue Bonnet to help you bake recipes that are sure to please, like these delicious chocolate chip cookies. Great for baking or sauteing. Per serving (1 tbsp) ... Cal. ... Fat ... Chol. Blue bonnet stick (14g) ... 60 ... 7g ... 0mg. Butter (14g) ... 100 ... 11g ... 30mg. how2recycle.info. Satisfaction guaranteed. Questions or comments 1-800-988-7808. For delicious recipes, visit bluebonnet.com. Parkay® 60% Vegetable Oil Spread. 0g Trans fat per serving*. 0mg Cholesterol per serving. No hydrogenated oil. Fresh & creamy taste. Per 1 tbsp serving: 70 Calories. 3g Sat. fat, 15% DV. 130mg Sodium, 5% DV. 0g Sugars. Net Wt 16 oz (1 lb) 454g. 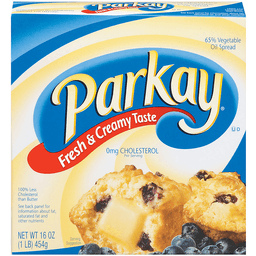 Enjoy the rich buttery taste of Parkay® on all your favorite foods, and it's cholesterol free! 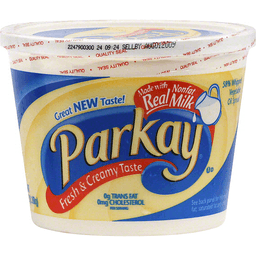 Try these other great Parkay® products: Parkay® Light. Parkay® Squeeze. Parkay® Spray. For delicious recipes, Visit our website. 0g Cholesterol per serving. Per serving (1 tbsp) ... Cal. ... Fat ... Sat. fat ...Chol. Parkay® Original Stick (14g) ... 70 ... 8g ... 3g ... 0mg. Butter (14g) ... 100 ... 11g ... 7.0g ... 30mg. how2recycle.info. Questions or Comments, Call Mon.-Fri., 9:00 AM-7:00 PM (CST), 1-800-988-7808 (except national holidays). Please have entire package available when you call so we may gather information off the label. Visit us at www.parkay.com. 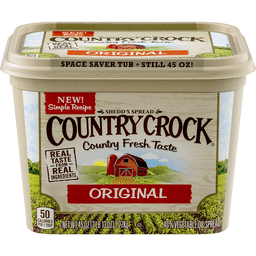 Country Crock® Calcium Spread. New simpler recipe. Space saver tub. Country fresh taste. Good source of calcium. With vitamin D. See nutrition information for fat and saturated fat content. 45 Calories per 1 Tbsp. 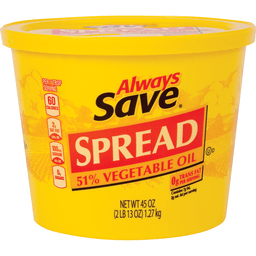 32% Vegetable oil spread. Gluten free. 0g trans fat per serving. No partially hydrogenated oils. No cholesterol per serving. Per serving: - fat - sat. fat - cal - trans fat. Country Crock calcium - Fat - 4.5g. Sat. Fat - 1g. Cal. - 45. Trans. fat - 0g. Butter - Fat - 11g. Sat. fat - 7g. Cal. - 100. Trans. fat - 0g Questions or comments Call 1-800-579-3663. Or visit us at countrycrock.com. ©Unilever. Country fresh taste. 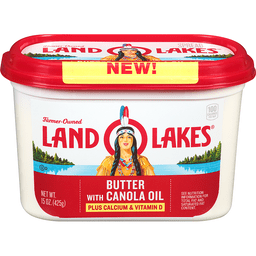 50% less fat & calories than butter. 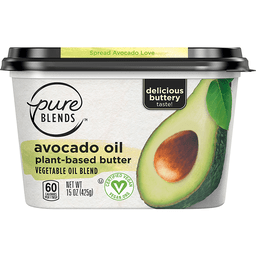 Contains essential fats for healthy growth & development (Contains 280 mg of omega 3 ALA per serving, which is 17% of the 1.6 g daily value for ALA and 2200 mg of Omega 6 LA per serving.). No hydrogenated oil. 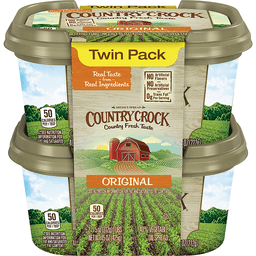 No trans fat (5 g fat [1.5 g saturated fat], 0 g trans fat per serving). No cholesterol per serving. 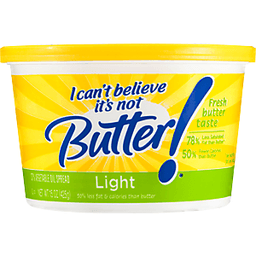 Contains 50% fewer calories & fat than butter. Per Serving: CC Light: 5 g fat; 1.5 g sat. fat; 50 cal; 0 mg chol. 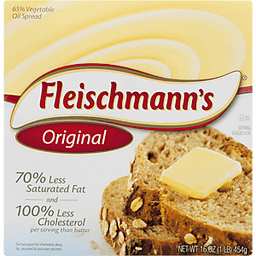 Per Serving: Butter: 11 g fat; 7 g sat fat; 100 cal; 30 mg chol. Gluten free. Did you know? 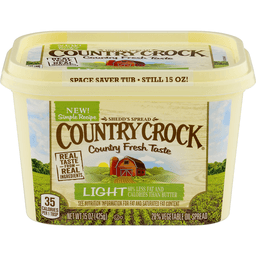 The delicious goodness of Country Crock Light contains essential fats, omega 3 ALA and omega 6 LA, for kids' healthy growth and development. Plus, it's a good source of vitamins A & D. Nurture your family by serving meals that include a variety of fruits, vegetables, whole grain foods and fat-free or low-fat dairy. And for children over 4, a balanced diet also includes a range of 25% - 35% of calories from fat. 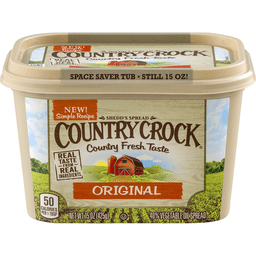 Country Crock® Light Shedd's Spread. New! Space saver tub. Simple recipe. Country fresh taste. Real taste from real ingredients. 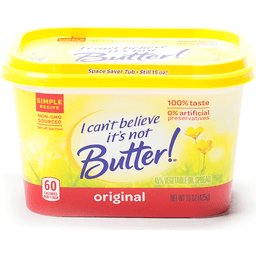 60% Less fat and calories than butter. See nutrition information for fat and saturated fat content. 35 Calories per 1 Tbsp. 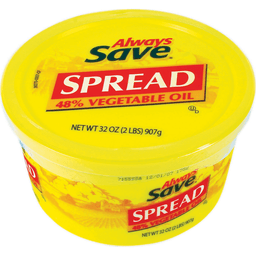 28% Vegetable oil spread. Gluten free. No artificial preservatives. 0g trans fat per serving. No partially hydrogenated oils. No cholesterol per serving. 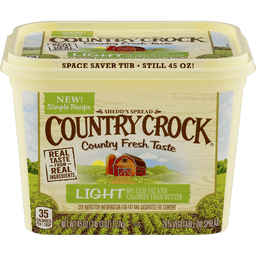 Per serving: Country Crock light - Fat - 4g. Sat. fat - 1g. Cal. - 35. Chol.- 0g. Butter - Fat - 11g. Sat. fat - 7g. Cal. - 100. Chol. - 0g. Questions or comments Call 1-800-579-3663 or visit us at countrycrock.com. ©Unilever. 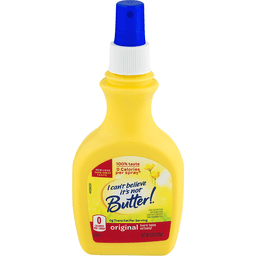 Blue Bonnet® 31% Light Vegetable Oil Spread. 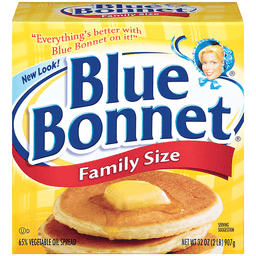 "Everything's better with Blue Bonnet on it™. Still 15 oz. 60% Less fat & calories than regular margarine. No hydrogenated oil. 0g trans fat per serving. 0mg cholesterol per serving. See nutrition information for fat content. 40 calories per serving. 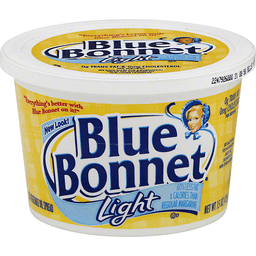 Per serving (1 tbsp): Blue Bonnet Light (14g): Cal - 40. Fat - 4.5g. Chol - 0mg. 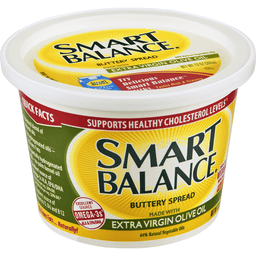 Per serving (1 tbsp): Margarine (14g): Cal - 100. Fat - 11g. Chol - 0mg. 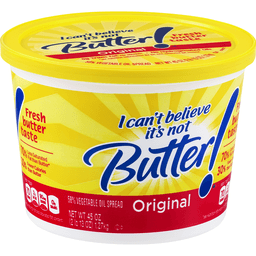 Per serving (1 tbsp): Butter (14g): Cal - 100. Fat - 11g. Chol - 30mg. 0mg cholesterol. 100% less cholesterol than butter. ConAgra Foods®. Food you love. Gluten free food. Questions or comments Call 1-800-988-7808. Satisfaction guaranteed. For delicious recipes, visit bluebonnet.com. 45% vegetable oil blend. Spread avocado love. Delicious buttery taste! Spread plant love. Pure Blends believes that everyone can love plant-based eating. Which is why our deliciously creamy buttery spreads make it easy to incorporate nature's unique plant-based oils, like avocado oil, into your diet. Learn more about our commitment to putting plants first for a happy life and a better world at pureblendsbrand.com. Putting Plant First: From our daily diets to the wider world, join us in the movement to spread plant love every day. Master-blended plant-base oils. 60 calories per 1 tbsp. Monounsaturated fat per serving. 0 g trans fat per serving. Vegan. Certified vegan. Vegan.org. Gluten free. Good source of Omega 3 A LA (Contains 160 mg of Omega 3 ALA per serving, 10% of the 1.6 Daily Value for ALA). See nutrition information for fat and saturated fat content. No artificial preservatives or flavors. No artificial partially hydrogenated oils. For Questions/Comments: Visit Us at: pureblendsbrand.com. Call Us: 800 909 9943. Please recycle.